For the Church Year. Composed by Douglas Smith. General, Spiritual. String Solos & Collections. Lorenz Publishing Company #30/1777L. Published by Lorenz Publishing Company (LX.30-1777L). Hymn tunes often spring to life with the introduction of a new timbre, such as the violin, but it is often difficult to know how or where to utilize the addition. These collections solve that problem and give violinists the opportunity to enhance the music of the church, whether it be a featured number, or an unscheduled addition to a congregational hymn. Well-suited to the average violinist, these obbligatos are flexible and may be performed as solos, accompanied by any typical hymnbook harmonization, as violin duets, or as accents to congregational singing. Where several keys are standard for the same hymn tune, all have been included. 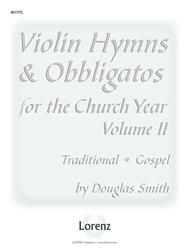 The scope and versatility of this collection make it a must have for all church violinists. 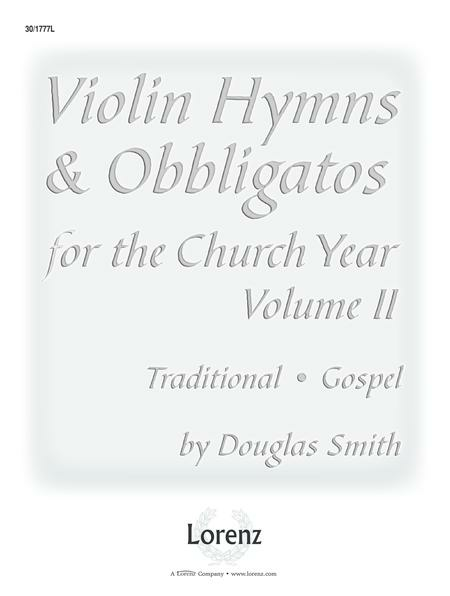 Volume 1 includes DIADEMATA, LYONS,LOBE DEN HERREN, ADESTE FIDELES, HYFRYDOL and 57 other seasonal and standard hymns. Volume 2 includes SALVATIONIST, CONVERSE, NETTLETON, HIGHERGROUND, BETHANY and 32 other traditional, early-American gospel songs.